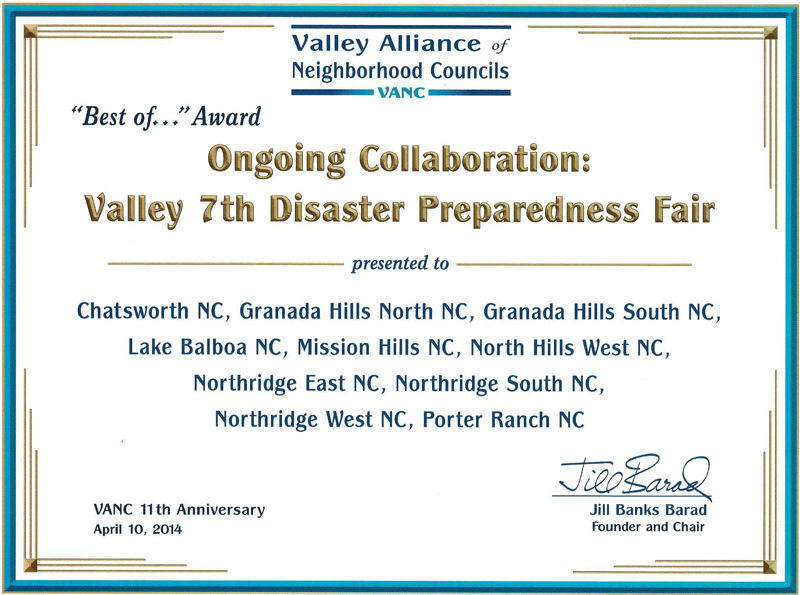 About 8 years ago, a small group of Neighborhood Council members passionate about emergency preparedness formed the North Valley Disaster Preparedness Team for the sole purpose of managing and presenting a Valley Disaster Preparedness Fair. Their success has been phenomenal. 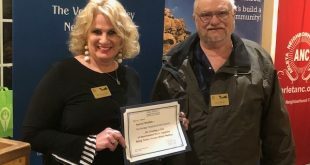 Now in its 7th year, the group previously dropped the “North” from its name because there had been so much interest in expanding the Fair’s reach to encompass much more of the Valley. Some of the original founders are still involved and many of the same individual NCs have been contributing and participating from the beginning. The fair emphasizes individual as well as neighborhood preparedness and awareness. In addition to free food, a highlight is the distribution of free Emergency Preparedness starter kits to families that register. Last year, the Fair gave away 500 kits. The fair has grown steadily. Last year over 1,200 attended. In addition, nearly 300 vendors, NC representatives, Scouts, police and fire cadets and other support personnel. In 2013, 10 area Neighborhood Councils participated:, Granada Hills North, Granada Hills South, Lake Balboa, Northridge East, Northridge South, Northridge West, Mission Hills, North Hills West, Chatsworth, and Porter Ranch. Each NC also has an outreach booth at the Fair. Additional funding, donations, and resources were provided by Councilmember Mitch Englander, public-private partnerships, and local businesses. Sponsors and contributors share the cost of the starter kits, food and incidental expenses to produce the fair. No selling is permitted but hundreds of products are displayed, and there are many demonstrations and activities for adults and children. Free food is prepared and served “post-disaster” style. In previous years, the schedule has included the Red Cross children’s safety puppet show as well as presentations on use of a fire extinguisher, electrical safety, sidewalk CPR, Jaws of Life, and CERT. The Yogi Bear Shakey-Quakey School House is there to give visitors a hefty shake. Other participants include the LAPD, CHP, Coast Guard Auxiliary, Civil Air Patrol, Red Cross, Southern California Gas Company, LADWP and Ham radio operators. There are also raffles for safety products and free child ID kits, courtesy of Granada Hills Masonic Lodge 378. This year’s Fair will be held on September 27, 2014. Previous Northridge West Neighborhood Council-Sponsored First Aid & CPR Training Was a Success!